- This essay will inevitably contain spoilers! Throughout its history, mainstream Hollywood has relied on public interest in key historical events for many of its major successes, this contextual background helping to shape not only the historically-based epic but also other genres such as the western and the gangster film. It is an odd twist of irony that the big studios have judiciously avoided certain ‘controversial’events which do not, it feels, have a ‘desirable’subject-matter in favour of a now rather predictable standardised product devoid of any significant cutting edge. Thus, the 1999 Columbine High School massacre has not yet received a cinematic dramatisation to bring its horrific story to a mainstream audience- it is left to the ‘Indy’branch of the Hollywood movie tree to do just that. Ben Coccio’s 2003 film Zero Day takes Columbine firmly as its inspiration, using so many factual events connected with the event that the usual cinematic divide between fiction and reality becomes less clear, this blurring making Zero Day ultimately a more telling film as a result. The film’s very title- Zero Day - refers to an attack that is unknown, therefore impossible to defend against. This sinister connotation is continued in the driving soundtrack that accompanies the opening credits montage, but is underscored by the childhood photographs of Andre and Cal and home-movie footage of Cal celebrating his birthday. Thus, these innocent images offset the title and soundtrack yet at the same time create a curious sense of foreboding- an increasing sense of urgency pervading this introduction to our main two characters, an urgency that is abruptly halted when the credits end. As Zero Day opens, the title ‘June 23rd, 2000’(one of many throughout the film) introduces the timescale (clearly after Columbine yet close enough to this recent historical event) and also the location- a gloriously sunny day outside an American High School. The way events then unfold, as Andre (Andre Keuck) and Cal (Calvin Gabriel) set up the tripod and record their brief piece to camera, draws attention to both the process of construction and that of documentary, both of which continue throughout the film as a whole. Therefore, an air of plausibility, a ‘could-happen-ness’, blurs the fiction/reality divide especially when the true facts of the happenings at Columbine are known to the audience. This opening scene is important to the film as a whole, for it grounds the relationship between Andre and Cal as well as their relationship with the society in which they live. It is this dysfunctional existence that causes Zero Day (and consequently Andre and Cal themselves) to act like a timebomb- we the audience fully expect it (and them) to go off, the only question is when it will all do so. Stylistically, Zero Day makes a rather radical departure from a traditionally filmed narrative. Instead of presenting two teenagers who are filmed by a film crew (who are therefore outside the diegesis), Zero Day lets its characters do the filming, a fact that is often forgotten. For example, one scene features Andre driving and talking directly to camera in a shot that would conventionally be held by a cameraman (whose credit would come after the main cast members). This time, however, it is Cal who holds the camera, thereby altering the relationship between the characters and the audience, as a mediatory layer is removed- that of the film crew- the film becoming more personal and intimate as a result, as the events seem less mediated. As Zero Day progresses, due to the sheer unfamiliarity of such a technique, it is easy to overlook this aspect and consider the ‘missing’boy to be somewhere else, not actually filming the scene. In fact, such a technique does more than restructure the character/audience relationship- it ensures that both boys are with each other almost the whole time when the camera is rolling, which symbolises their togetherness in their mission and raison d’etre as well as bringing the audience into their close sphere, as I have argued. (The technique is additionally interesting when the morals of the pair are considered, as the audience is, in effect, being aligned with the plans Andre and Cal come up with through temporal and special familiarity with the boys’movements). The other significant stylistic aspect to Zero Day concerns its documentary feel, conveyed in the subject-matter (based on a real-life event), spontaneity of action (‘dead time’moments are included), of dialogue (often improvised) and its frequent titles which advance from June 23rd,2000 to the final caption on May 10th, 2001. This has the effect of segmenting the film into key areas of time which reflects mood and narrative significance for its leading characters. In presenting two teenage protagonists who are, conversely, likeable anti-heroes, Zero Day enables Andre and Cal to discuss ‘The Army of Two’and their weapons on July 4th, early on in the film’s narrative. That this date is also Independence Day is significant- the pair are fighting for their ultimate independence from a world they feel is so alien to their way of thinking and also marking their freedom to decide on their own destiny. The spontaneity of the fireworks that closes this section of the film is also important, for so much of the dialogue and activity seems just that. Thus, July 10th sees Cal addressing the camera (therefore the audience) directly, but that it is ‘so weird looking at yourself on video’and later ‘I’m staring right at you’through the tape’, the shaky camera and blurred focus endorsing the unscripted nature, although, and in another of the film’s many ironies, the pair’s ultimate aim is meticulously organised and planned. 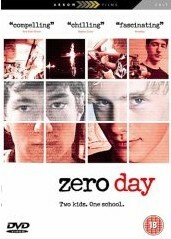 Although Zero Day uses the Columbine massacre as its narrative inspiration, it does not intend to be a fictional dramatisation of that event, but instead highlights the potential contextual background to an event that mirrors it. Thus, although the climax of the film is indeed the school shooting-spree, the film as a whole does not prioritise the end over the means- it is pretty clear from early on in the film what the pair intend to do, the intriguing aspect is in observing how they go about it. Thus, Andre marks his 18th birthday on July 17th by filming his parents with his new camera, emphasising the aspect of creation as well as the self-reflexive nature of Zero Day itself. The gathering round the table is informal yet slightly uneasy in the evident gulf between Andre’s parents (particularly his father) and the two boys. Tellingly, the reference to Brad introduces the character (who we never see) through their eyes as someone who is the epitome of their hatred, providing a stimulus for the next sequence when they pelt Brad’s house with eggs, the camera’s visceral involvement (it is handheld and shaky) implicating the audience in their deed and, again conversely, bringing us closer to the pair, especially when Andre lays flat on the ground afterwards in a posture of pure exaltation, and we- the audience- are encouraged to share in this moment of triumph. On July 25th, Andre and Cal’s organisation is strongly marked as they discuss the safety deposit box at the bank, jump cuts fragmenting the scene as the audience is let in on the secret, once more brought closer to these two teenagers. The actual inclusion of this scene (let alone their conversation) is another example of the documentary aspect that pervades the whole film, which is, in part, a ‘life-as-it-is’aura that is superficially present yet underscored in sinister fashion by Andre and Cal’s activities. Thus, the caption ‘July 31st’reminds us that the pair are essentially normal teenagers (Cal has his braces removed) with normal parents (the caption reads ‘Cal’s mother’). It is this very sense of normality that the pair detest, and the film critiques, as by August 2nd Andre is presenting a mock television programme entitled ‘Home-Gun Review’. It is really at this point, when the guns are revealed and primed, that the seriousness of the pair’s actions is driven home to the audience, as events seem to move on ceaselessly (and increasingly rapidly) towards their inexorable conclusion. August 8th sees Cal and Rachel in the cemetery, the latter commenting that she feels Andre is ‘a little offbeat’a little strange’. Cal’s comment that it is ‘kinda cool’to continually record things therefore divides the pair in terms of both outlook and interests, as he and Andre are above the superficial analysis of contemporaries that Rachel seems to favour- the strength of Cal and Andre’s relationship is that they accept each other and are united in their desire to achieve one overall objective. The remainder of August builds up the plan for ‘Zero Day‘in an even more sinister fashion, the 21st being the key date when the pair go out into the countryside to shoot with Andre’s cousin, Chris. This sequence is the first time we have actually seen people shooting- the use of children’s toys as targets shows that Andre and Cal have moved clear of their childhood and are now beyond salvation, paving the way to their own youthful destruction. As they arrive back at Chris’house at night time, the documentary aspect recurs again as a boy cycles past and calls out ‘why’re you filming me?’, which maintains the verisimilitude of the occasion- Zero Day is drawing attention to its artifice, and the process of creation, yet at the same time not doing so in its naturalness and spontaneity. It is this rather bizarre mixture of style and verisimilitude that makes the film so compelling. Although the film presents a very bleak narrative, Zero Day is also keen to offer some mitigating factors for its protagonists. Thus, August 25th shows Cal with his family in the woods, whilst as he sits with Andre on September 3rd, family photographs dominate the walls behind the very computer on which exists their plan for ‘Zero Day‘. In a very real sense, Andre and Cal’s relationship is akin to that of a married unit- they share a unified vision and the film presents their quest to realise this vision, as I have argued. They do not quarrel until September 28th, in the brief but significant scene at the Performance Center. There, Cal wears a black T-Shirt with the one word ‘ARMY’written across it, and recites a curious poem about violence, causing angry disbelief from Andre who feels his friend has talked too much, and offered too many clues to a general public he wishes to keep at an ignorant distance from what they are planning to do. On January 10th, 2001 the pair set a date of May 1st for ‘Zero Day‘(the day when the temperature is exactly zero degrees having not transpired), giving the resulting titles a growing sense of unease as it is effectively a countdown to the film’s major event, an event that has been discussed since its very opening. Significantly, Cal states ‘I’m comin’out in a black plastic bag’, crystallising the point that both boys are doomed- they will die in the realisation of their plan. Later, on April 2nd, the pair discuss the anticipated link with violent media products (like games) which people will conclude influenced their actions, Andre again taking the lead: ‘that’s just how stupid people are’, showing a sophistication and cynicism of his fellow human-beings, even though his words have a grain of ironic truth. Directly following on from the assertion that the world will attempt to find a motivation for the boys’actions in their possessions, Andre and Cal conduct a ceremonial burning of their worldly goods (which includes, intriguingly, Lord of the Flies and The Bible). Four days later, with ‘Zero Day‘fast approaching, Cal attends the Prom in a limousine, in a strikingly normal, all-American High School activity. Interestingly, and perhaps unsurprisingly, he looks very much out of place, symbolising his lack of integration into the very society he loathes. By contrast, Andre is working in a pizza place when his Father brings along the camera to film his son, the two travelling home together drawing the comment ‘I’m proud of you’from the normally reserved older man, deeply ironic when the timing of such a remark is considered. This section of Zero Day is rare, for it separates Andre and Cal (each is doing different things, therefore not being filmed by the other), but they are swiftly brought back together as Cal leaves the raucous frivolity of the limousine for a quiet night with Andre, the pair recording their ‘confessional’video diary alone, a serious task being contrasted with the reckless abandon of the Prom which represents both ‘normality’(convention) and the peer group Cal and Andre belong to yet despise. Once more in this scene, it is Andre who takes the lead. ‘We’re gonna be God’- he declares- ‘we decide who lives and who dies’. Thus, Zero Day is seen as the solution to their problems- a time of ultimate power when the pair will indeed have the Fate of their compatriots firmly in their charge. Later, Andre leads again as he and Cal break into Chris’house to steal the guns and ammunition, giving the orders to Cal as the pair successfully acquire their desired weapons. ‘Zero Day‘finally occurs on May 1st, and the title of ‘8.41 a.m.’offers the precision of documentary film that is sombrely clinical when combined with the natural diegetic sound the film has utilised throughout. In a moment of emotion, the pair admit that they could not have achieved what they have without each other before setting out on their final mission, and leave their camera behind. It appropriately stays fixed as Andre and Cal move away into the distance toward their High School. The next images are taken from inside the school and create an immediate contrast with what has gone before, as we now watch monochrome CCTV footage. The images are fixed, and, although the events unfold in front of us, are purely in long shot. The effect of this, as well as situating events in their context, is to conversely distance us from what is happening- unlike the earlier colour footage which brought us close to Andre and Cal, here we are powerless. The soundtrack is a 911 operator combined with the sound of unfolding events, giving the whole sequence a very eerie and unnerving feel. This whole sequence is, in fact, structured around a few select numbered cameras positioned around the school, and, from our exalted high angle, the protagonists of Zero Day seem doomed- and we watch helplessly. Ironically, it is the normally more reserved Cal who loses his temper with the cowering students attempting to escape, and, in a subsequent melancholy moment of role-reversal, it is Andre who feels he cannot commit suicide. In the end though, Andre and Cal do commit suicide- that they shoot themselves rather than attempt a shoot-out with the police mark them as still in full control of their own destinies. With this, the film does not end, however, but moves on to May 10th. Here, a car-load of youths approach the crude wooden crosses that mark the final resting-places of the shooting victims, and seek out those of Andre and Cal, whose crosses have been covered in graffiti. Then, as they set these two crosses alight and curse the pair, Zero Day ends, on a rather curious note. Throughout its duration, the film has presented two teenage boys with a grudge against society attempting to release their frustrations in a high-school shooting. As I have argued throughout, the film does not seem to present overt criticism of the pair, despite their ultimate goal. Rather, Zero Day concentrates on how Andre and Cal plan for such an event. The ending of the film throws what has gone before into disarray, and calls into question that the ending was a compensation for representing the pair in the very way I have noted, with a fair amount of compassion or, at least, understanding. As the flames lick into the sky, and the end credits roll (accompanied by Benji Cossa’s superb Volcano on the soundtrack), the overriding emotion of Zero Day is sadness and a sense of waste. Yes- our two main characters achieved their goal (usually a signifier of audience satisfaction and contentment), but it is with the ultimate sacrifice- their own lives. True, they are willing to make such a sacrifice, but that argument rather misses the point. Like the real Columbine massacre, Zero Day is symptomatic of modern society in turmoil, where the disaffected fringes have moved away from the mainstream and, in extreme cases, take action to voice their discontent. Zero Day is not an easy film to watch, but its richness will reward those who give it their time and attention, and hopefully encourage a greater understanding of the human condition as a result. Zero Day, directed by Ben Coccio, is available on DVD from Arrow Films.